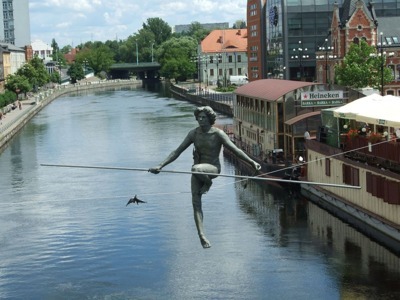 Bydgoszcz is a city in which history is interwoven with the present, and only a few tens of meters from the post office each can see the new business card of the city - the sculpture "Crossing the River", which was established in 2004 in honor of Poland's accession to the EEC. Leaving the embankment and going along narrow streets to the city center, it is worth paying attention to the eclectic-style building of the city court with a nearly 50-meter tower. Opposite the building is a majestic monument to the King of Poland, Casimir III. One can not help but visit the Cathedral Church of the city, which was built at the end of the 16th century and famous for its miraculous icon "Madonna with a Rose". The bright and multi-colored decoration of the church completely changes the idea of the Catholic churches as gloomy and deprived temples. Not less interesting is the Church of the Clarisks, in an architecture of which the medieval Gothic and the Renaissance, ascending to the ancient Greek art, were intertwined. These are just a few of the wonderful sights that can be explored while visiting the city of Bydgoszcz. If you are planning to travel to one of the cities in Poland, you need to take care of your comfort and safety. 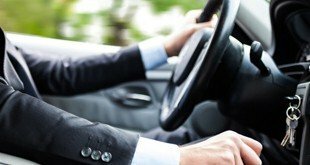 Therefore, it will be reasonable to use the services of a reliable company where it is possible to rent a good transportation car with an experienced chauffeur. 8rental.com. offers every person going on a trip to Bydgoszcz their high-quality services for renting various cars for the most diverse number of people. Just send us a quote and let us plan your trip in the most accurate and individual manner. To begin the adventure of exploring Bydgoszcz it will be best to do it from the embankment, from where each can see an amazing view of the rows of ancient barns, as well as the suite of bridges connecting numerous channels and rivulets that pierce the whole city. 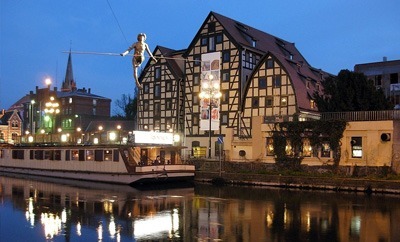 To finish the walk around Bydgoszcz is a pedestrian journey through residential areas, which will be remembered by the romance of small humpbacked bridges and the beauty of small houses made in the German architectural style of half-timbered houses. As you can see we offer our customers not just an automatic reply to their requests but a personalized guided tour, which will make your trip unforgettable. The service offers high-quality and fast cars of three classes, the cars are equipped with all the most necessary amenities for tourists to feel comfortable and safe. The cars' interiors of this company are always in a clean condition, they are regularly checked by auto mechanics. Therefore, all customers of 8rental.com. can be confident of their safety and comfort. The company's chauffeurs are professionals in their field. They work at a high level and are always ready to turn any trip around the city into an interesting and unforgettable trip. They are punctual, responsible and in order to make your communication really pleasant, they all speak at least one of the international languages, and in some cases even more than one. This service for renting a modern and luxury car is the best solution for a trip. Traveling to Bydgoszcz can be ideal if to use the services of a reliable company, where every tourist will get a great car.